Mac Data Analysis for Excel (Knowledge Miner yX) is a knowledge and data mining tool that works with data stored in Microsoft Excel for Mac to build predictive and descriptive models from this data autonomously and easily. Mac Data Analysis for Excel utilizes modeling technologies built on self-organization principles by learning from noisy data with unknown relationships between output and input of any data driven system. The data analysis takes an evolutionary approach by progressing from a very simple model to an optimal complex model which generalizes efficiently. Relationships found in the data can then be employed with confidence for forecasting and prediction of ongoing systems. Unique self-organizing modeling technologies are implemented to allow the modeling to be objective and simple to use. An analytical model that describes the data is produced and presented to the user in Excel. Analytical models are output to new Excel worksheets. Variable selection is not necessary as data is self-organized in the analysis. Ultra-fast processing with multi-core, multi-processor and vector processing support and scaling optimization. High end professional modeling with free upgrades. 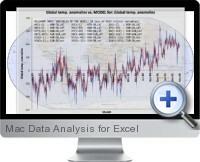 Supports all versions of Excel for Mac 2011, 2008 and 2004.